While we’re currently living in Spain, we plan to take advantage of the exceptional position of our new base by taking frequent side trips throughout the year. However, we do want to keep it lower key than last year when we hopped around from country to country barely taking to time to really dive deep into most of them. We’ve already shared the many things we plan to do in Spain and the travels we have in mind for France. Really there is only one more European country that we want to take things a littler further with this year: England. Because we’re trying to be more focused in our travels, we’ve decided to stick to northern England specifically. As we began brainstorming destinations in the north, our list seemed to fill up quickly with the many English destinations we’ve always wanted to see. <— That’s the sentence I wish I could write. What I must truthfully write is –> We’ve already seen all of England because we were in London last summer. Why bother to go again? What’s that you say? There’s more to England than just London? Well now I’m just confused. Well if we’ve learned anything from traveling with our friend Ed from RexyEdventures it’s that London is not England. We’ve mentioned to him that the next time we fly through London we should meet up. He responded to this remark with a twitch in his eye and stiffened jaw to clarify that he is from Hull and does not live near London. “Surely Hull is a suburb of London,” we thought to reply but held back for fear of causing further offense. Alright, alright. We get it! There is much more to see in England outside London. With many option for city breaks in the UK, it’s now time to start doing our research and pick some destinations to aim for as we begin assembling plans. The mostly likely time we’ll commence our English holiday is when our French visas run out and we’ll be forced to leave the Schengen Area. As Americans can still spend up to 6 months in England. It’ll be the perfect time to visit knowing we’ll probably still not be ready to return to the U.S. Here’s our five picks to work our way from the west coast to the east. Liverpool is perhaps best known among Americans for being the city that produced The Beatles (or did they produce today’s Liverpool?) and would be a great start to work our way further north and on to the east coast. While in Liverpool, a tour of Casbah Coffee Club is the visit that takes you back in time to The Beatles beginning. 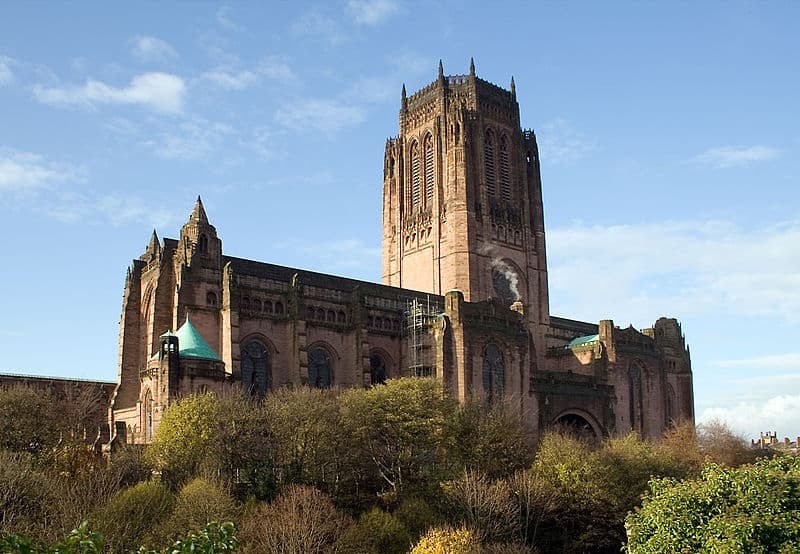 But music marvels aside, there’s also historic sightseeing to do including the Anglican Cathedral which is the largest in the UK. Great city views are one of our favorite attractions so while carrying hope for a clear day, a climb to the top of this cathedral should be well worth it. Still in the North West region of England but working our way inward would find us in Manchester, home to one of the most popular football teams, Manchester United in Old Trafford. Yes, I just made a sports reference! You just can’t live in Spain and not learn something about football. 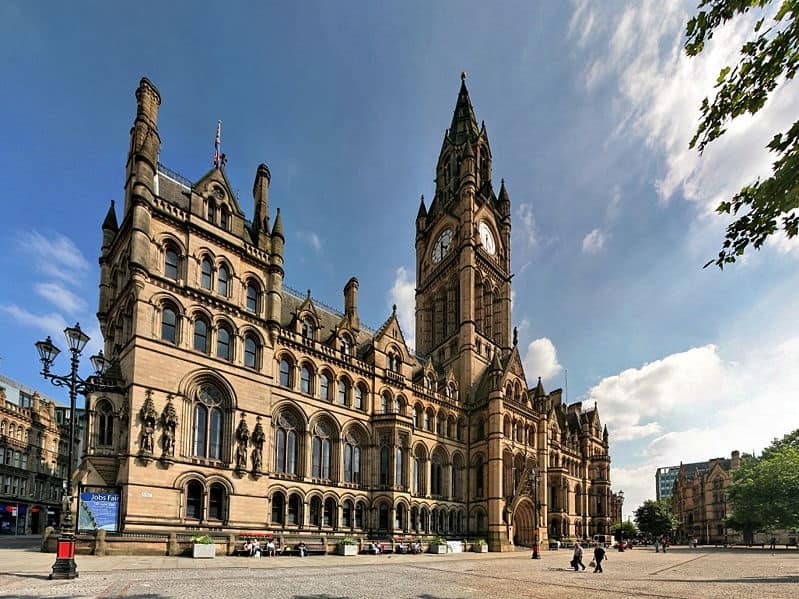 The architecture is also to be admired including the neo-gothic style of the Manchester Town Hall in Albert Square. As we’ve mentioned previously our desire to go to Manchester’s Gay Pride, a visit to Canal Street in Gay Village would be a highlight, especially since it was the setting to the UK version of one of our favorite TV programs Queer As Folk. Leaving the North West region and continuing east would bring us to Yorkshire where we would visit York, built by the Romans in 71 AD and filled with history. The well preserved City Walls of York date back nearly two millennia and are a stretch of over two miles worth appreciating. 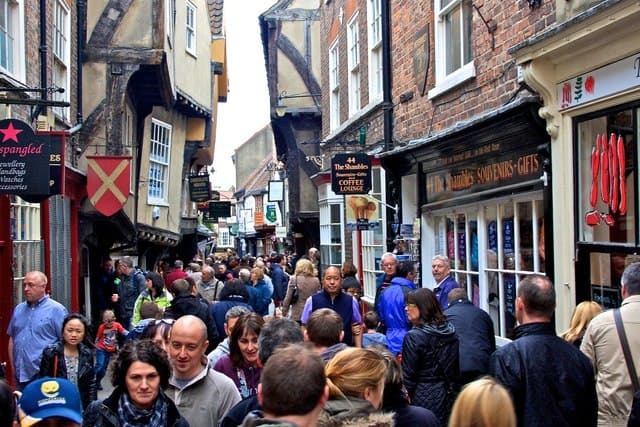 A stroll down the Shambles, York’s most visited street dating back to medieval times, is where many shops and eateries can be found today where butcher shops once stood. If cathedral’s are in mind, and that can vary widely for us, then York Minister will be the focus as a remarkable gothic cathedral from the 13th century. Our reason to visit: University in a Castle?! 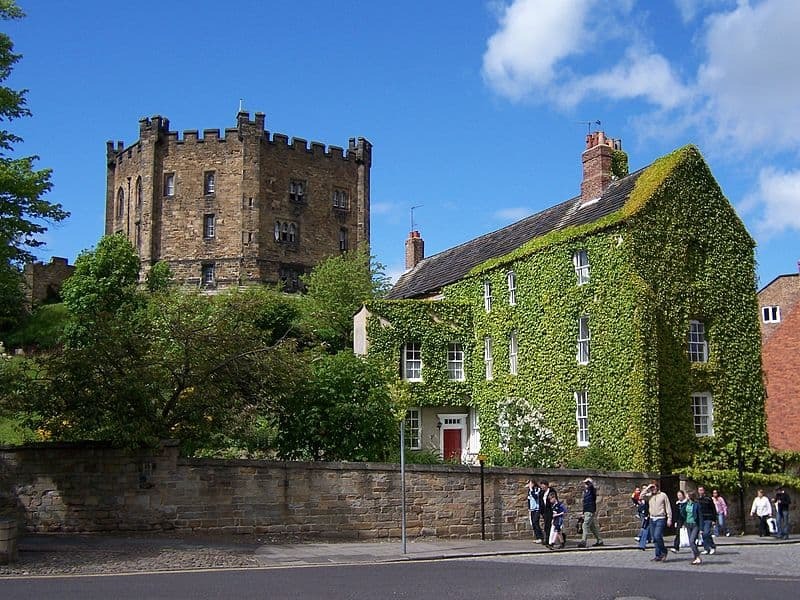 Finally entering the North East region of England, a stop in Durham should include a visit to the 11th century Durham Castle. What makes this World Heritage Site interesting is not just that scenes from Harry Potter were shot here as well as at the Durham Cathedral, but that today it houses a university, the University of Durham. To visit the castle turned college you must have a tour guide which is usually done by a university student. Finally arriving on the east coast of England, Newcastle boasts a drinking culture we could fit right into. 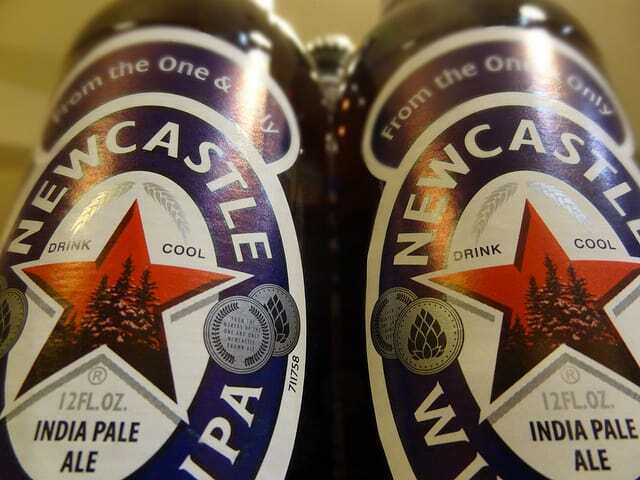 We’re no strangers of Newcastle Brown Ale and will happily sip it right in its city roots. 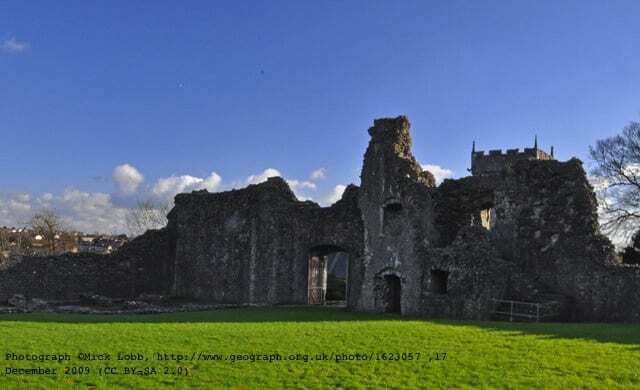 However, before we enjoy the libations, a visit to The Castle, circa the 12th century, is in order to see the two main parts, the Castle Keep and the Black Gate. For something a little more distinct as far as sight seeing, a tour of Victoria Tunnel is intriguing. It was originally built to transport coal in the 19th century then later used as an air raid shelter during World War II. Have you toured Northern England? What are your favorite destinations? Thanks Dani! I think it would make for a fun road trip from the west to the east. Perhaps when we make it to Durham you could give us some more suggestions! Good list, manchester is my home town and i love it. You should visit the castlefield area of manchester – great bars and restaurants in the summer, right next to the canal. As someone who like Rex travels a lot and currently lives in the Hull area I feel Ed’s pain. I visit the US often and many people I meet there have the same misapprehension about our wonderful country of England. I always tell people from other countries who want to visit that London is an un-English experience. It is not the real England, in fact anything but. With thousands of years of history, great buildings, historic landmarks, Roman and Viking settlements, battles with our neighbours, music, industry, innovation…. Need I go on? It doesn’t all happen in one city. Visit Cambridge or Oxford (but don’t ask where the University is), see Bath, York, Shrewsbury, Sheffield, Leeds, Penrith, Whitehaven, Birmingham, Hull, Wakefield, Dover, Exeter, Carlisle and so much more. There really is so much to see. After all Americans aren’t all from New York or LA even though US television seems to have a heavy focus on these places. Yes you’re totally right! Ed and kindly (and continuously) reminded us of all the great places in England. And yes I totally agree, London is totally different. It’s an international city with both English people and expats from around the world so the feel is definitely different. Good lad! So pleased you managed to explore outside of London!